Stroke patients are starting a trial of a new electronic device to recover movement and control of their hand. Neuroscientists at Newcastle University have developed the device, the size of a mobile phone, which delivers a series of small electrical shocks followed by an audible click to strengthen brain and spinal connections. The experts believe this could revolutionise treatment for patients, providing a wearable solution to the effects of stroke. Following successful work in primates and healthy human subjects, the Newcastle University team are now working with colleagues at the prestigious Institute of Neurosciences, Kolkata, India, to start the clinical trial. Involving 150 stroke patients, the aim of the study is to see whether it leads to improved hand and arm control. Stuart Baker, Professor of Movement Neuroscience at Newcastle University who has led the work said: "We were astonished to find that a small electric shock and the sound of a click had the potential to change the brain's connections. However, our previous research in primates changed our thinking about how we could activate these pathways, leading to our study in humans." Publishing today in the Journal of Neuroscience, the team report on the development of the miniaturised device and its success in healthy patients at strengthening connections in the reticulospinal tract, one of the signal pathways between the brain and spinal cord. This is important for patients as when people have a stroke they often lose the major pathway found in all mammals connecting the brain to spinal cord. The team's previous work in primates showed that after a stroke they can adapt and use a different, more primitive pathway, the reticulospinal tract, to recover. However, their recovery tends to be imbalanced with more connections made to flexors, the muscles that close the hand, than extensors, those that open the hand. This imbalance is also seen in stroke patients as typically, even after a period of recuperation, they find that they still have weakness of the extensor muscles preventing them opening their fist which leads to the distinctive curled hand. Partial paralysis of the arms, typically on just one side, is common after stroke, and can affect someone's ability to wash, dress or feed themselves. Only about 15% of stroke patients spontaneously recover the use of their hand and arm, with many people left facing the rest of their lives with a severe level of disability. 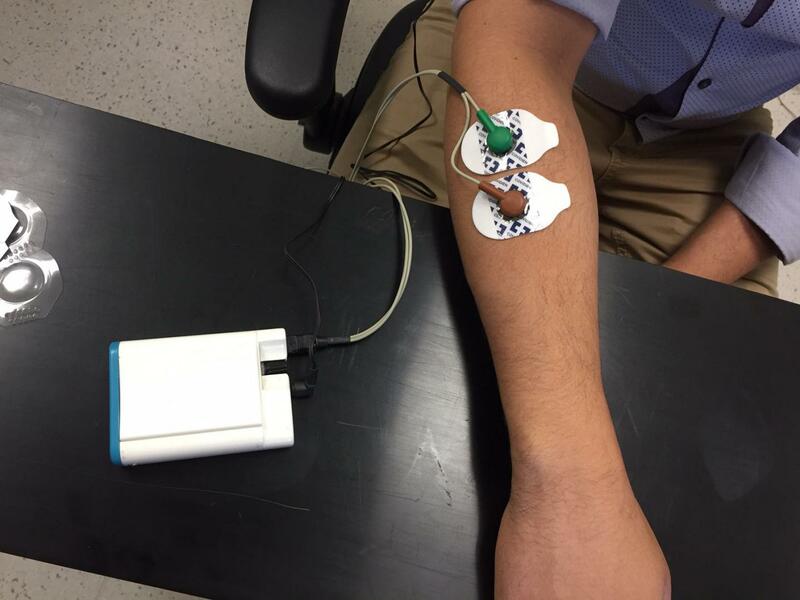 Senior author of the paper, Professor Baker added: "We have developed a miniaturised device which delivers an audible click followed by a weak electric shock to the arm muscle to strengthen the brain's connections. This means the stroke patients in the trial are wearing an earpiece and a pad on the arm, each linked by wires to the device so that the click and shock can be continually delivered to them. "We think that if they wear this for 4 hours a day we will be able to see a permanent improvement in their extensor muscle connections which will help them gain control on their hand." The techniques to strengthen brain connections using paired stimuli are well documented, but until now this has needed bulky equipment, with a mains electric supply. The research published today is a proof of concept in human subjects and comes directly out of the team's work on primates. In the paper they report how they pair a click in a headphone with an electric shock to a muscle to induce the changes in connections either strengthening or weakening reflexes depending on the sequence selected. They demonstrated that wearing the portable electronic device for seven hours strengthened the signal pathway in more than half of the subjects (15 out of 25). Professor Stuart Baker added: "We would never have thought of using audible clicks unless we had the recordings from primates to show us that this might work. Furthermore, it is our earlier work in primates which shows that the connections we are changing are definitely involved in stroke recovery." The work has been funded through a Milstein Award from the Medical Research Council and the Wellcome Trust. The clinical trial is just starting at the Institute of Neurosciences, Kolkata, India. The country has a higher rate of stroke than Western countries which can affect people at a younger age meaning there is a large number of patients. The Institute has strong collaborative links with Newcastle University enabling a carefully controlled clinical trial with results expected at the end of this year. REFERENCE: Spike-timing Dependent Plasticity in the Long Latency Stretch Reflex Following Paired Stimulation from a Wearable Electronic Device. KH.M. Riashad Foysal, Felipe de Carvalho, Stuart N. Baker. I had a stroke at the age of seven. The immediate effect was paralysis of the right-hand side of my body, which caused slurred speech, loss of bowel control and an inability to move unaided. Though I have recovered from these immediate effects, I am now feeling the longer term effects of stroke; slow, limited and difficult movement of my right arm and leg. My situation is not unique and many stroke survivors have similar long-term effects to mine. Professor Baker's work may be able to help people in my position regain some, if not all, motor control of their arm and hand. His research shows that, in stroke, the brains motor pathway to the spinal cord is damaged and that an evolutionarily older signal pathway could be 'piggybacked' and used instead. With electrical stimulation, exercise and an audible cue the brain can be taught to use this older pathway instead. This gives me a lot of hope for stroke survivors. My wrist and fingers pull in, closing my hand into a fist, but with the device Professor Baker is proposing my brain could be re-taught to use my muscles and pull back, opening my hand out. The options presented to me so far, by doctors, have been Botox injections and surgery; Botox in my arm would weaken the muscles closing my hand and allow my fingers to spread, surgery would do the same thing by moving the tendons in my arm. Professor Baker's electrical stimulations is certainly a more appealing option, to me, as it seems to be a permanent solution that would not require an operation on my arm. I was invited to look around the animal house and observe a macaque monkey undergoing a test and this has made me think about my own stroke and the effect it has had on my life. I have never seen anything like this before and I didn't know what to expect. The macaque monkey that I observed was calmly carrying out finger manipulation tests while electrodes monitored the cells of her spinal cord. Although this procedure requires electrodes to be placed into the brain and spine of the animal, Professor Baker explained how the monkey had been practicing and learning this test for two years before the monitoring equipment was attached. In this way the testing has become routine before it had even started and the animal was in no pain or distress, even at the sight of a stranger (me). The animals' calm, placid temperaments carry over to their living spaces; with lots of windows, natural light and high up spaces the macaques are able to see all around them and along the corridors. This means that they aren't feeling threatened when people approach and are comfortable enough that even a stranger (me, again) can approach and say 'hello'. From my tour of the animal house at the Institute of Neuroscience I saw animals in calm, healthy conditions, to which the tests were just a part of their daily routine. Animal testing is controversial but I think that the work of Professor Baker and his team is important in helping people who have suffered stroke and other life-changing trauma to regain their independence and, often, their lives.